Other presidents perhaps have said worse, but not for all to hear. 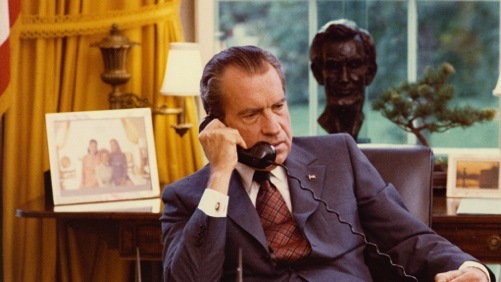 HBO’s latest In His Own Words documentary is an oral history of Richard Nixon timed to coincide with the 40th anniversary of his Aug. 9, 1974 resignation of the presidency at the height of the Watergate scandal. Nixon By Nixon (premiering on Monday, Aug. 4th at 8 p.m. central), does not suffer from a lack of material. It easily could stretch well beyond the allotted 75-minute running time, with 3,700 hours of Oval Office recordings to choose from in addition to Nixon’s other interviews with the news media he so detested. Others are heard from as well, including former chief domestic advisor John Ehrlichman. He was one of many to be unaware of his boss’s taping mechanism, utilized from 1971 to ’73 as a means of preserving history. Ehrlichman, who died in 1999, hopes that a “committee of historians” someday will listen to all of the tapes before drawing their conclusions about Nixon. They’d come away seeing him as “the strangest paradoxical combination of any man I ever heard of. And they’d be right,” Ehrlichman says. Most of the flash points in Nixon By Nixon are from his taped conversations. They’re skillfully illustrated and subtitled, although most of the audio is crystal clear. Nixon’s views, then and now, are often jarring. Nixon then ticks off the names of Walter Cronkite, Dan Rather, Harry Reasoner, John Chancellor, Daniel Schorr and Eric Sevareid as some of his principal antagonists. Rather, the only current-day survivor of this group, is “just a sonofabitch, don’t you think?” he asks Colson. Nixon is more cordial in conversations with his wife, Pat, and daughter, Julie. But although friendly, their exchanges are also perfunctory. The president obviously had a lot on his mind. So when Tricia happily asks him about going to Trader Vic’s for a family dinner, he agrees without any extended chit-chat. Julie quickly signs off, seeming to know when their “conversation” has run its course. Nixon By Nixon is produced and directed by Peter Kunhardt, whose work for HBO also includes oral histories of John, Robert and Edward Kennedy, and Gloria Steinem. And although it’s been told many times many ways, Kunhardt’s up-close look at the only American president ever to resign from office is absorbing from its opening minutes to the dark denouement. Nixon, who died in 1994 and fought against his tapes going public, says in a table-setting interview that he went into politics after dropping what seemed to be a promising musical career. “Sometimes I rather regret it,” he adds. So do those of us who lived through Nixon’s life, times, prejudices and deceptions, which are amplified anew in this anniversary week by the tapes he came to see as a “probably stupid” idea.